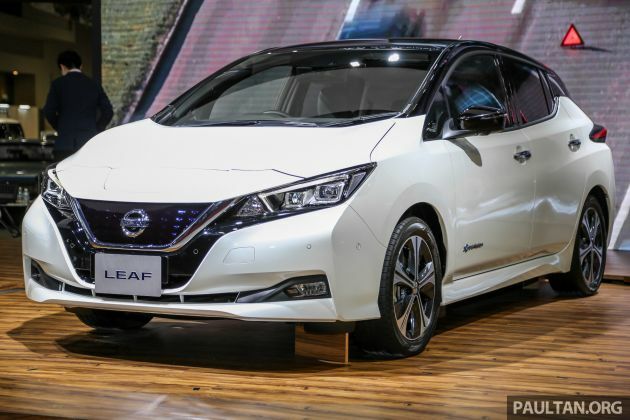 The Nissan Leaf has been launched in Thailand, unveiled at the ongoing Thailand International Motor Expo 2018. The second-generation electric car goes for 1.99 million baht (RM252,298) in the Land of Smiles and deliveries will begin from March 2019. 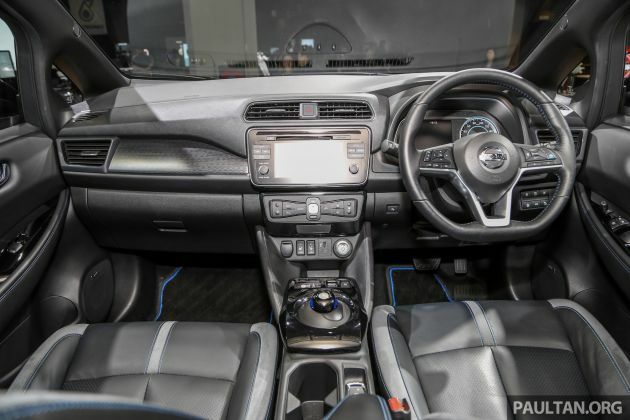 “In Asia and Oceania, we are planning to launch in seven markets, including Thailand, Malaysia, Singapore and Hong Kong, and these markets we will launch in parallel on top of Thailand,” said Yutaka Sanada, Nissan’s regional senior vice-president at the launch. Locally, the Leaf was displayed at the recent KL International Motor Show (KLIMS) 2018, and we understand that the timeline for its Malaysian launch has been revised to sometime in the middle of 2019. As the EV is unlikely to be locally assembled, will it be competitively priced? That will depend on the upcoming National Automotive Policy (NAP) review by MITI. Measuring in at 4,480 mm long, 1,790 mm wide and 1,540 mm tall, the new Leaf features significant gains in performance and range over the first-gen model, with the car’s EM57 electric motor now producing 38% more power and 26% more torque at 110 kW (148 hp) and 320 Nm respectively. A 40 kWh lithium-ion battery increases the operating range to around 400 km (378 km on a NEDC test cycle) from the 195 km – and later, 250 km – of the original. In terms of charging, the automaker quotes eight hours for a full charge drawing current from a six kW source, and double that time from a three kW source. There’s also quick charging, with up to 80% fill in 40 minutes via the CHAdeMO charging socket. The max AC charge rate is 6.6 kW, or 50 kW with DC quick charge. Tech novelties include ProPILOT single-lane autonomous driving tech, which can automatically control the distance of the car to the vehicle in front using a speed preset by the driver (between 30 km/h and 100 km/h), while steering and keeping itself centered in its lane. It also does braking to a complete stop and resuming movement too, much like the low-speed follow function in Honda’s Sensing suite. Aside from ProPILOT park, there’s also e-Pedal, which provides the simplicity of starting, accelerating, decelerating, stopping and holding the car in position by using the accelerator pedal alone. The Leaf is equipped with six airbags (front, side and curtain) and a Nissan Safety Shield system, which includes intelligent lane intervention, lane departure warning, intelligent emergency braking, blind spot warning, traffic sign recognition, rear cross traffic alert, intelligent around view monitor and emergency assist for pedal misapplication. Wow.. C-Class price. I fear for our Malaysia pricing. 7 years ago MAI told the rakyat of Malaysia to buy EV cars because the Government wanted the rakyat to buy EV cars and was pushing this agenda. At that time, Leaf was about RM200k. Many people could not understand why the Government of Malaysia, 7 years ago, was asking the normal lay person to buy a RM200k car. There were hardly any EV car but the Leaf and one or two others. According to EPF’s own statistics, 78.3% of ALL its contributors only earn RM1500 and below. So even the price 1 million who cares. It is not cheap enough for mass pipu. Malaysia also will be RM230k. Bodoh pricing. This shows MITI and our tax given for EV makes no sense. MAI and MITI dun determined the pricing for Thailand lar. One can buy a 530e pre reg for the money they are asking. Or a pre reg X3. Wonder are Thai ppl are so rich to pay this kind of price ? and how many of them can afford ? Buy RM100k below car. The rest of the money use as petrol. Whole life also won’t finish for petrol at 152k… Such pricing is killing sales or no sales. People of Singapore earn 5X more than Malaysians. Singapore SGD also 3X more than the ringgit. Then explain thailand price much higher than MY. R u gonna say thailand oso earns 5x more than us? Lame excuses. And so people thought car price in Malaysia is one of the most expensive in the world. Good (second) car. Bad price. Wowzers! Almost same price as Leaf when at here. So who sez our car prices is most exp in the world? Let’s do some calculation. Assume lowest rate of electricity is Rm0.30 kW/h. It takes 8 hours to fully charge the new Leaf with 6kw source. That means 48 kw/h or Rm14.40 electric bill for 400km range. Let assume a Toyota Vios with 15km/l FC. To get 400km it will need 26.67 liter or Rm58.67 with Ron95. The different for the same range is Rm44.27. If Vios price is 85K and new Leaf is 200K, the delta will be 115K. If you pump Rm58.67 petrol (or drive 400km) every week for your commute, it will take (115,000 div by 44.27) 2597 weeks for the Leaf to break event. 2597 weeks is equal to 49 years. I wonder how they can sell an EV or hybrid in SEA monsun country due to our climate(flood, off road etc). Here i think people don’t care anything about CO2 or green house as long as they can avoid from risk of being execute (by short circuit) due to driving an EV into flood water. Two Thumbs down for Nissan (Thailand) for being stingy on accessories and pricing. Nissan’s long term strategy => Higher price than usual = Better future resell value. Short/medium-term strategy => Supply-driven marketing tactic to create uniqueness and specialty segment prior to the second phase mass marketing. However, this old school marketing strategy hasn’t been successful in the new era of technological disruption. Modern history will repeat itself again as the more efficient new comers will eventually overtake the old school lackluster. Digital photography wiped out Kodak in a matter of few years, Flat screen TVs, smart phones from China and Korea overtook Japanese and European leading brands by surprise because of features &pricing. Nissan must learn a lesson now otherwise the new comers from China and Europe will gain most benefits of this new segment in a phenomenal fashion. I’ll be glad if Nissan can prove me wrong. This is even more expensive than a Tesla Model 3. The leaf doesnt even come close in software & hardware compared to Tesla. luxury car price but budget car performance figures. I don’t expect Msian pricing to be too far off. This thing is stillborn if that’s the case.